Even a casual glance at new Russian site BigLion shows you that the creators not only copied Groupon’s business model, but they also just ripped the site design and navigation off completely, too. The sites look nearly identical, even down to the smallest details. What’s more, the practice seems to be accepted in Russia, and the new service has gotten some legitimate press that plays the cloning out as if it’s just a smart business decision (translation here). dp.ru says the service is “ideologically close” to Groupon (an alternative translation says it’s an “analogy.” and notes that Groupon raised $30 million in late 2009, “and thereby confirmed that the business model works.” Not a word about the ethical and legal issues around cloning the site and the business model. There’s a handy note at the end of the article for any other would-be Russian cloners out there. They note that CrunchBase posts news of “promising American startups” that have received investments. Perhaps a Russian or German clone of your startup is a simple badge of honor. But how anyone can hold their head up high when this is how they make a living is beyond me. There’s real tech innovation going on in Russia. Things like this just crush the entire community’s reputation. 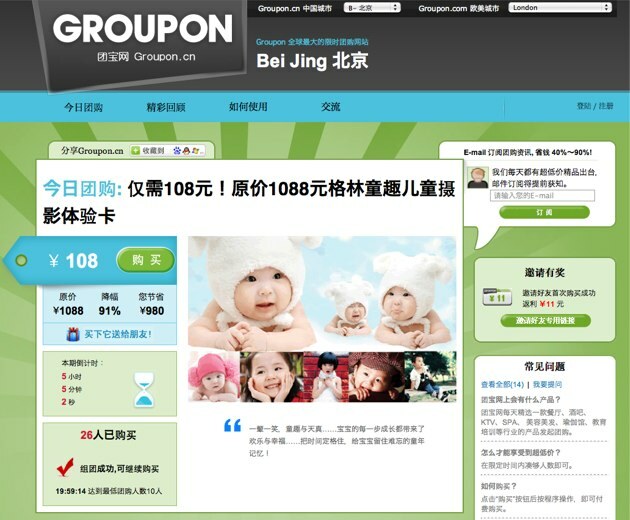 Update: Groupon CEO Andrew Mason points out Groupon.cn, another clone of Groupon. They go one step further than BigLion by just ripping off the name, too.